Indore is contemplating a new public bicycle sharing system. Although public bicycling schemes—like the ones across Europe, America and, more recently, China—are a relatively new concept in India, Indore’s more than 500 bicycle rental shops have been operational for close to 20 years, serving a limited closed user group clientele. The shops, that also provide repair and maintenance services, are located in low-income areas or around transport terminals like bus stands and railways stations, and they are frequented by factory workers, daily wage laborers and visiting traders. This phenomenon has developed over the years, and while it lacks a formal system, it does possess an organic efficiency that endears its users. The arrangement is built largely on trust, and most shop owners rent out their cycles only to people they know or people recommended by existing users. A few shops allow customers to rent cycles against a refundable deposit of up to Rs. 2000 (US$40) or by handing over an original personal identification document. With non-motorized transport becoming increasingly important in the sustainable integrated transport mix, the Atal Indore City Transport Service Co. Ltd. (AICTSL) is keen to set up a formalized public bicycling scheme in the city, building on the existing availability and usage, and incorporating a model that would include sophisticated bicycles, docking stations and revenue from advertising to offset operational costs. The hope is to affect an increase in the cycling mode share, which is currently at 14 percent. AICTSL and EMBARQ India recently conducted a preliminary study to help assess the existing scenario, as well as the infrastructural and financial viability for setting up this system. The study shows that the current informal backdrop will present several opportunities and challenges moving forward. The availability and usage patterns leave room for a scheme that can complement rather than compete with the current system. As it stands now, the system is exclusive and restricted; it is limited to a certain section of society. The introduction of a formal system will increase the number of users and allow for wider participation. Furthermore, despite the 40,000 bicycles available for rent in the city, several vendors said that they often did not have enough bicycles to meet the demand. Indore’s existing bicycle rental scheme also constrains users. It requires renters to drop off the bicycle at the point of pick-up. While this is good for people renting the bicycles for an entire day for multiple trips, as in the case of hawkers and traders selling their wares, it imposes constraints on users wanting bicycles for short-distance trips, which is the primary use of a formal public bicycling scheme. Introducing this feature into the system opens up possibilities for it to be used as a feeder to the upcoming bus rapid transit (BRT) system and other transport networks, with the docking stations placed in strategic locations. This can also be incorporated in development plans for new housing complexes to improve accessibility, while avoiding the use of motorized transport. The study indicates that some of the reasons why the system has been working well for more than two decades are that the owners earn an average of Rs. 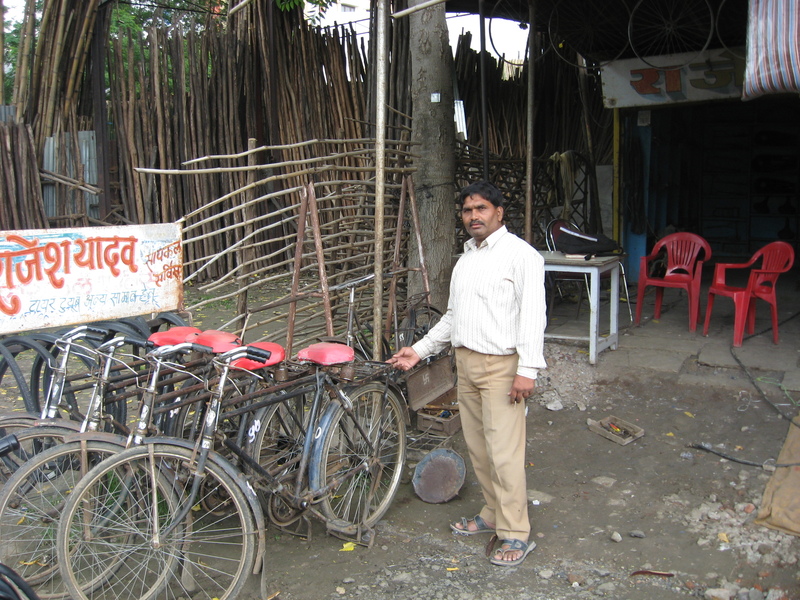 180 (US$3.58) per bicycle per month, provide employment for one person for every 30 bicycles, and undertake repair and maintenance for their own (as well as privately owned) bicycles. Despite the obvious opportunities and benefits a public bicycling scheme would bring, the city of Indore will also have to consider several other factors, such as improving road infrastructure for cyclists, alternate mechanisms not heavily dependent on technology, and secure parking for bicycles, which would raise interest and appeal to more people opting to use cycles. There is a lot to learn from the success of the traditional system, recognizing that there isn’t a one-size-fits-all answer to public bicycling schemes, and instead, that each city should tailor the system to best address the needs of its people.